Business transactions take place every second—orders, payments, account tracking, and many more. Often, all participants to a transaction have their own ledgers— and, thus, their own individual versions of the facts. Having multiple ledgers can lead to error, fraud and inefficiencies—vulnerabilities that can be reduced by having a common view of a transaction end-to-end. Blockchain technology enables a shared ledger to record the history of transactions with consistency and certainty. In a blockchain network, all parties to a transaction must give consensus before a new transaction is added—and once recorded in the blockchain network, a transaction cannot be altered. Blockchain eliminates or reduces paper processes—speeding up transaction times, increasing efficiencies, and building trust among participants to a transaction. How can blockchain benefit government? 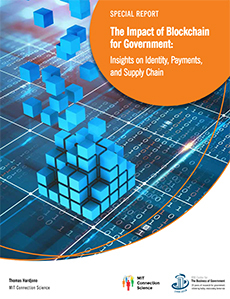 How can government lead the way to a broad-based blockchain evolution that drives economic vitality? In this report, Thomas Hardjono—Director of the MIT Trust: Data Consortium—addresses these and related challenges by drawing insight from three roundtable discussions in 2017-18 among key leaders and stakeholders, hosted by the Congressional Blockchain Caucus. The roundtables helped frame key issues impacting blockchain and government, particularly focused on how blockchain can improve identity management, payment accuracy, and supply chain integration. Read Government Computer News' story on the report, "What legislators are learning about blockchain." Review our infographic on the report.